Shiny or dull, colored or clear, the first thing you see when you look at a guitar is its finish. The finish may have a subtle effect on tone as it vibrates along with other parts of the instrument, but its real job is to help keep the guitar looking good. It's a good idea to know a bit about your guitar's finish so you can better maintain it. A Collings guitar with a classic "sunburst" shaded finish. Historically, guitars have been finished with many different materials and techniques, but it would be way beyond the scope of this short introduction to talk about many of them. Water based finishes, penetrating oils or natural violin type varnishes are rarely used on standard "production" acoustic guitars, which today are usually finished with shellac, lacquer or a catalyzed polymer. The finish may be a high gloss, completely dull and flat, or somewhere between (“satin”). It may be clear or colored, transparent or opaque. It's tempting to think that a dull or satin finish is “more natural” or that a colored finish is “heavy,” but neither is necessarily the case. Except for the gloss, that is. Glossy finishes are not difficult to maintain, because simply wiping the instrument with a soft cloth keeps it polished. “French polishing” is an ancient technique of wiping or rubbing shellac to apply a very thin high gloss finish. A natural resin dissolved in denatured alcohol, shellac has rather poor resistance to water, and it's usually applied in a very thin coating, so it also has very little resistance to scratches. The finisher applies coat after coat of shellac to “build” the finish to the desired thickness. Click here if you'd like to see the process in detail. A French polish finish may have a very level, high gloss appearance, similar to highly polished lacquer. Or it may have a satin sheen, slightly streaked in appearance when viewed in reflected light. Fancy guitars often had a much thicker application of French polish than plain models in order to show off elaborate inlay work under a high gloss. 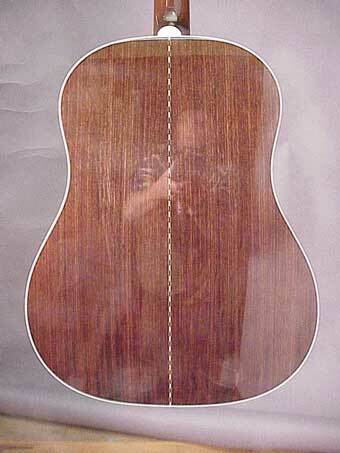 Some luthiers, especially classical guitar makers, believe that French polish enhances the tone of a fine guitar. French polishing is a difficult skill to master, and very labor-intensive; today it is used most frequently on expensive classical guitars, or on guitars made where spray equipment and solvents are at a premium, as in the guitar making city of Paracho, Mexico. Shellac French polish does not tend to turn yellow when exposed to sunlight, although the shellac itself may be perfectly clear or quite amber-orange when first applied. Any other coloring is usually done by applying a stain or dye directly to the wood before the French polishing begins. 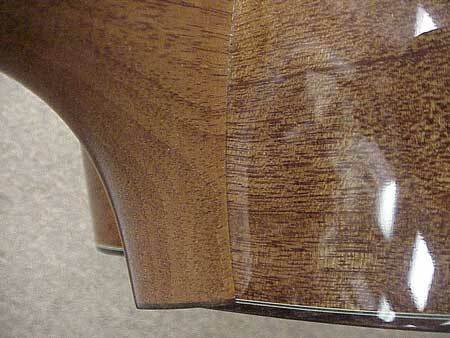 Of all the conventional guitar finishes, French polish requires the most care. The best way to care for it is to keep it clean and to avoid excessive handling. Abrasive guitar polishes are almost certain to cause premature wear. French polish is extremely delicate and easily scratched, but it can be restored by a skilled finisher. Around 1925 - 1930, guitar factories started using spray equipment to apply nitrocellulose lacquer, a fast drying synthetic finish consisting of a resin dissolved in petroleum distillates. Like shellac French polish, lacquer is an “evaporative” finish, meaning that the solvent simply evaporates, leaving the resin behind on the surface. 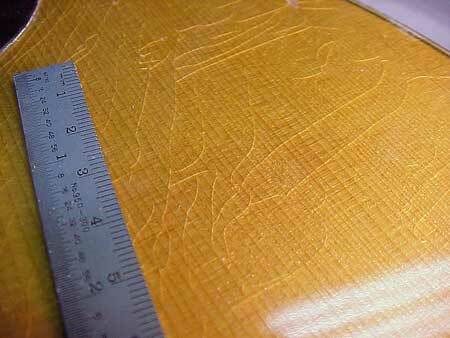 Scratches can be touched up successfully because the lacquer can be dissolved or softened by its original solvent. An experienced finisher can blend and level new finish into an old scratch with surprisingly good results. Lacquer saves a terrific amount of time compared to French polishing. The finisher sprays successive coats of lacquer to build the finish to its final thickness, sanding the finish level between coats. Transparent or opaque coloring agents can be added to lacquer to provide a variety of effects. All the finish can be applied in just a few days, working just a few minutes a day. After the last coat of lacquer has been allowed to dry for a week or more, the final polishing begins. The luthier levels the finish by sanding with ultra fine abrasives, and buffs the guitar to a high gloss. Without the final sanding and buffing, the lacquer would be highly shiny and reflective, but the surface wouldn't be level. It would appear to have lumps, waves or “orange peel.” It's this final leveling and buffing that gives lacquer its reputation for high gloss elegance. In fact, I couldn't even take the picture without appearing in the reflection! Some instruments are finished with a flat, low gloss, or satin lacquer. The dull or satin finish is precisely the same material as its glossy counterpart; it just has a chemical additive to make it dry with a particular degree of sheen. Satin or flat finishes are frequently used on less expensive models because they save labor, requiring no final leveling and polishing. Some manufacturers use a satin finish on the neck, and gloss on the body. The low gloss finish is quite popular for use in performance because it doesn't reflect stage lighting. Lots of players simply prefer the look, too. 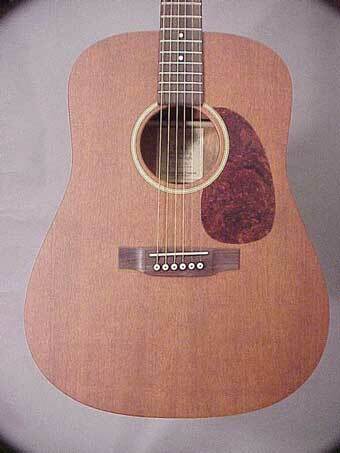 This Martin D-15 has a "flat" finish. In contrast to a "high" gloss, this finish is sometimes called "dead flat." An older satin lacquer finished guitar will tend to develop shiny patches in the place where the player's arm crosses the face, around the pickguard area, all along the neck, and any other place where it's handled a lot. It is usually impractical to try to correct this kind of wear. In general, low gloss finishes are more difficult to restore or touch up, as compared to high gloss finishes. A lacquer finish is more durable than French polish. It's more resistant to scratches, body heat, and the normal wear of handling. Light scratches can be buffed out with power equipment. Lacquer has much better alcohol and water resistance than French polish. It can be polished and maintained by a variety of finish care products and guitar polishes. Lacquer develops these cracks spontaneously if it's applied too thick. Thick applications of lacquer are a temptation for factories, because they can cover small surface defects in the wood. Some players turn lacquer soft just by touching it. The finish on the back of the neck and parts of the top may become so soft that it feels permanently sticky. Notice the dark area where the finish has softened completely and partly worn away, allowing dirt to be incorporated in the soft finish. Unfortunately, the only “cure” for this particular problem is refinishing with a different material. 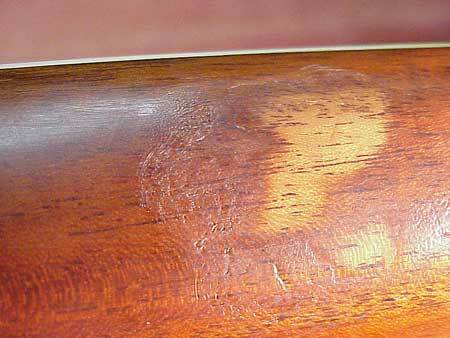 Lacquer is sensitive to the vinyl covering on guitar stands as well as the vinyl backing of guitar straps, and may soften and blister in areas of prolonged contact: Vinyl damage can usually be corrected by "spot refinishing" just the affected area. Click for more about vinyl damage. 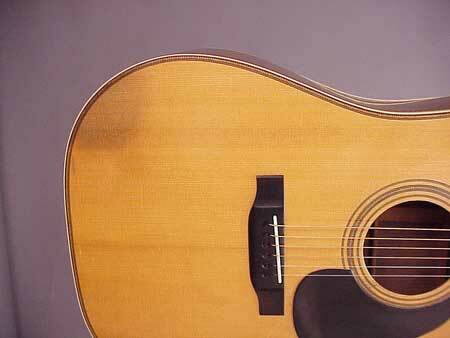 These days, the vast majority of acoustic guitars are not finished with either lacquer or French polish. Modern catalyzed polymer wood finishes have been developed to satisfy the factory's need for expedient production and the consumer's need for durability. These finishes are available in the same variety of colors and gloss as nitrocellulose lacquer. It has a high gloss body, and a flat finish neck. Catalyzed polymer finishes cure by a chemical reaction in which the liquid finish hardens to a solid material. The catalyst may be a second liquid, added to the first, or it may be atmospheric moisture, or even ultraviolet light. Catalyzed finishes don’t take weeks to dry, so they work especially well in factory production. Most catalyzed finishes are kinder to the atmosphere because they don’t require as much solvent for application. It's not necessary to understand the chemistry of the curing process to know how to live with a guitar finished with a catalyzed polymer. The most important features that all these finishes have in common are their physical properties once they're part of a guitar. Once it has cured, there's no solvent that will dissolve the finish. That means the finish is not likely to be damaged by any cleaning agent, and won't react to skin or vinyl contact. A catalyzed polymer finish can be applied much more thickly without crazing, so it's ideal for inexpensive instruments where there might be surface imperfections to fill in the finishing process. Catalyzed polymer finishes work very well on fine guitars, too, because they can be applied in the same thickness and polished just like traditional lacquers. The polymer finish is far more scratch resistant than shellac or lacquer, and rarely cracks or crazes with abrupt temperature changes. A sensitively applied and polished polymer finish looks just like lacquer, and does not inhibit the tone of a guitar. The bad news is that polymer finishes are not easily repaired. In order to do a really good finish touch up, it is necessary to soften or dissolve the original finish. This is simply not possible with polymer finishes, so the best touch ups will always be more visible, even in reflected light. How can you know what finish is on your guitar? Best to ask the manufacturer, because it's virtually impossible to tell by looking at it. Your local guitar finish expert can test the finish with solvents to determine its composition and check its suitability for repair. Virtually all the Asian factories use catalyzed polymer finishes, as do many of the modern American producers, such as Taylor, Ovation, and Tacoma. 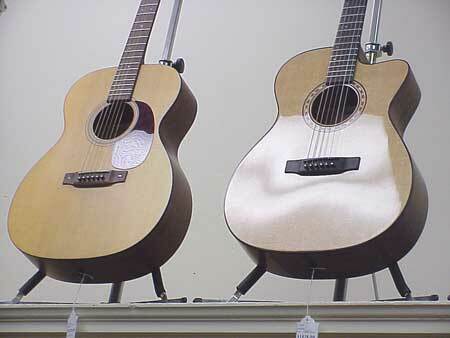 Martin uses a catalyzed polymer finish on many of their lower priced styles. 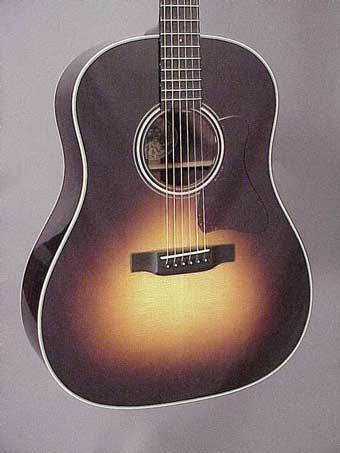 High end Martin models usually have lacquer on the bodies and catalyzed polymer finish on the necks. Gibson uses traditional nitrocellulose lacquer on all their acoustic guitars. Smaller "boutique" factories may also use catalyzed polymer, but the majority finish their guitars with lacquer. Santa Cruz, Collings, Goodall, and many other small shops take pride in their ability to achieve a nearly perfect polished surface with nitrocellulose lacquer. Most individual luthiers still use nitrocellulose lacquer, partly because it's the traditional finish for a fine flat top guitar, and partly because the technology of applying catalyzed finishes is more suited to a factory setting. Just as French polishing all but disappeared as lacquer became the standard finish, we are seeing lacquer giving way to the modern catalyzed finishes. As long as vintage instruments are highly prized, we'll have practitioners of the "obsolete" finishing techniques, not only in restoration but also in construction of exotic traditional instruments.